Wildly changing weather patterns last year, and a lack of snow in the mountains, have sent electricity rates soaring. Norwegian consumers are getting some shocking bills this month, double what they were at this time last year. 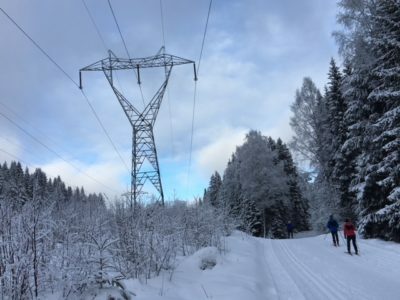 Newspaper Dagens Næringsliv (DN) reported on Wednesday that electricity rates have never been so high in Norway, a country with large amounts of hydro-electric power that traditionally kept electriticy rates relatively low. Since deregulation and becoming part of a bigger market in Europe, however, rates can also now be influenced by higher prices for coal and gas. Domestic conditions also play a role. Last year’s drought all but drained reservoirs in the mountains, where there’s now relatively little snow to melt and refill them. The situation can change quickly, he noted, and reservoirs can fill up again over the next few months. For the moment, however, their low levels are pushing rates up. They were high last year, too, at an average of 42 øre per kilowatt hour. Now they’re pushing 66.7 øre in eastern Norway, a new record. That’s setting a new record in Southern Norway, and closing in on higher rates in Europe, while electricity rates are lower in Northern Norway. DN reported average rates of 51.2 øre per kilowatt hour in the north, still high but not as expensive as in the south. Oslo, where energy consumption is high, is getting hit with the highest rates. The market is expecting rates well above 50 øre throughout the winter.